Show me someone who’s tried an edible and nine times out of ten, they’ll have a harrowing encounter with a mediocre baked good that made them question their existence. They also have probably never gone near an edible again. To be clear, we’re talking about THC edibles. With easier ways to infuse oils and fats, if you’re in pain or if you’ve had a tough workout, ingesting cannabis can be a good way to take down inflammation and keep your runner’s high… high. First, let’s talk about how edibles hit your body. Weed that’s been decarboxylated or cooked to release the most THC will metabolize differently in your system than if you hit a joint or vape. Joints and vapes get you high more quickly than eating weed because it hits your bloodstream through your lungs. As weed in this state is oil-soluble, it doesn’t bind very well to your blood and will bind to the more friendly endocannabinoid system. Result? You get high fast...and the results wear off equally as fast. Note: cannabinoids are hydrophobic—i.e. not water-soluble. THC becomes more water soluble once passing through your liver. Edibles are different. They have to get past the bouncer to your body, your liver. When you eat an edible, it metabolizes through your stomach and liver, and as a result, the potency increases. You heard that correctly: Eating weed will increase the potency of THC, changing the molecular structure from the oil-soluble delta-9-THC to the more water-soluble 11-hydroxy-THC. This process of metabolizing weed and getting it through your liver can take anywhere from thirty minutes to two hours—it all depends on your metabolism. But when the weed finally passes through your liver, 11-hydroxy-THC can travel fast throughout your body. Because it’s water-soluble, it can pass through your blood-brain barrier much more efficiently and travel quickly throughout your body. 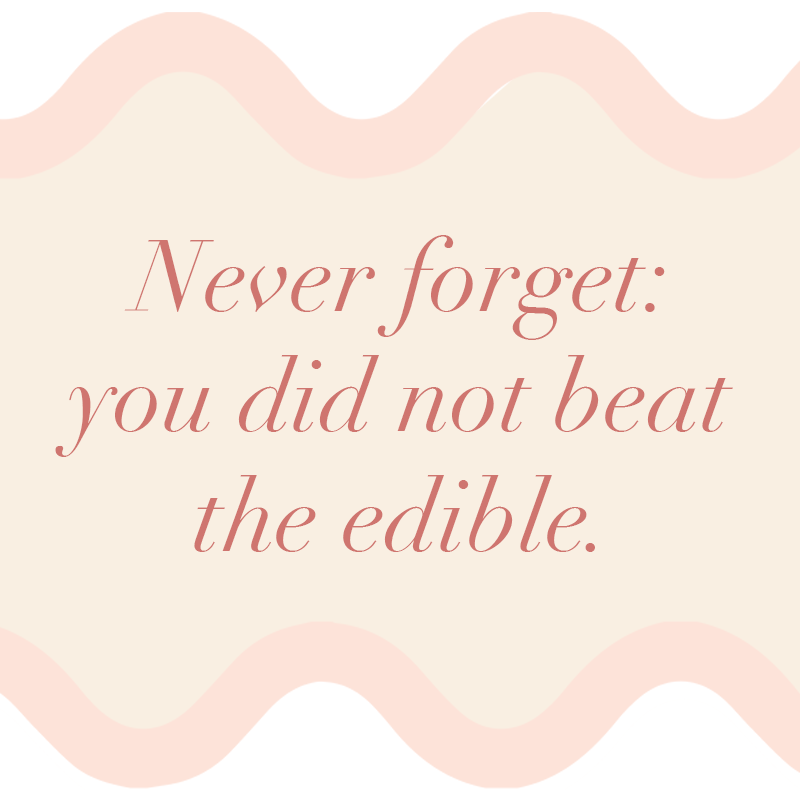 So unless you bought bunk edibles or aren’t good at measuring, sorry to tell you, but you did not beat the edible. However long it takes for your metabolism to process it, you eventually will feel high. Woe on the person who doubles, or, dare we say it, triples up on a dose. When trying edibles for the first time, particularly your own recipes, wait up to two hours for results. Everyone’s metabolism is different. Do not repeat the mistakes from your youth; this is science. Because edibles may help reduce inflammation, boost mood, and trigger the same high you get from running, in correct doses, it can be great post-workout. Or don’t work out and just get the runner’s high; you do you. Here is a recipe for delicious microdosed (2 to 4 milligrams of THC) tahini protein balls. To feel the effects post-workout, we recommend eating these either halfway throughout your workout or at the very end, or 30 minutes before you hit the gym if you want to feel something during your workout. Preheat your oven to 225 degrees Fahrenheit. Once the oven is ready, break up your weed, place on parchment paper, sand cook on a cookie sheet for 1 hour to ensure all the THC is active. For this recipe, we used a mild Tangie strain, which has about 15% THC. (You can also make your infused oil ahead of time. While your weed is decarbing, line a large dish with parchment paper and set aside. Place the pistachios, figs, apricots, salt, and cardamom in a food processor fitted with the blade attachment. Process until the fruit and nuts are broken down and clump together, about 1 minute. Add the tahini and process until fully blended, about 30 seconds. Now is a good time to taste (before you add the infusion) and calibrate to your taste buds. Leaving the mixture in the food processor, set aside and leave at room temp. Once your cannabis is decarboxylated, throw it into a LEVO machine with your coconut oil and set it to infuse for 3 hours at 175 degrees Fahrenheit. If you don’t have a LEVO, follow this recipe. Take 1 tablespoon of infused coconut oil and add to your food processor, blending for another 30 seconds. Measure out 1 tablespoon of the mixture and roll into a ball between the palms of your hands. Repeat with the rest of the mix for a total of 11 balls. If you want to add some flair, roll your balls in the extra crushed pistachio or, if you have a sweet tooth, dunk half in melted chocolate and dump pistachio on it to make it stick, so you look like some Michelin-starred pastry chef. Refrigerate for at least an hour (preferably overnight) before serving. You will feel the effects in 30 to 120 minutes, depending your metabolism.